In the basement of the Irving K. Barber (IKB) Learning Centre, tucked in a corner behind multiple glass doors and a security desk, is a dim backroom that is curiously colder than the rest of the building. In the basement of the Irving K. Barber (IKB) Learning Centre, tucked in a corner behind multiple glass doors and a security desk, is a dim backroom that is curiously colder than the rest of the building. 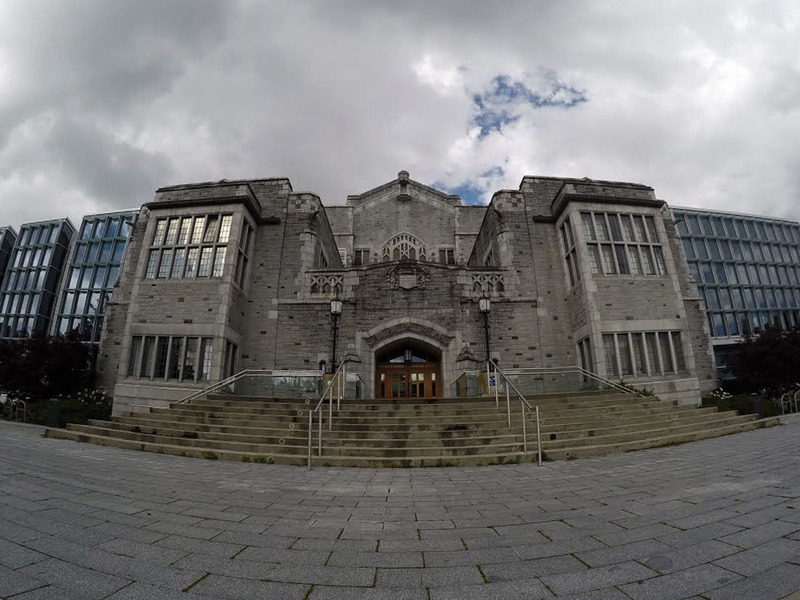 This is the Chung Collection, just one small portion of UBC’s vast Rare Books collection. With more than 25,000 items in this room alone, the Chung Collection fits more than a century of Canadian history into its tightly packed drawers and display cases. The myriad of objects stored away in these display cases rarely sees much traffic from students, but for those who are willing to venture into the depths of IKB, there is a world of treasures waiting. The walls of the Chung Collection gallery are lined with Canadian Pacific Rail advertisements ranging 1924 to the mid-1950s, most of which are the work of Saskatchewan-born Peter Ewert. 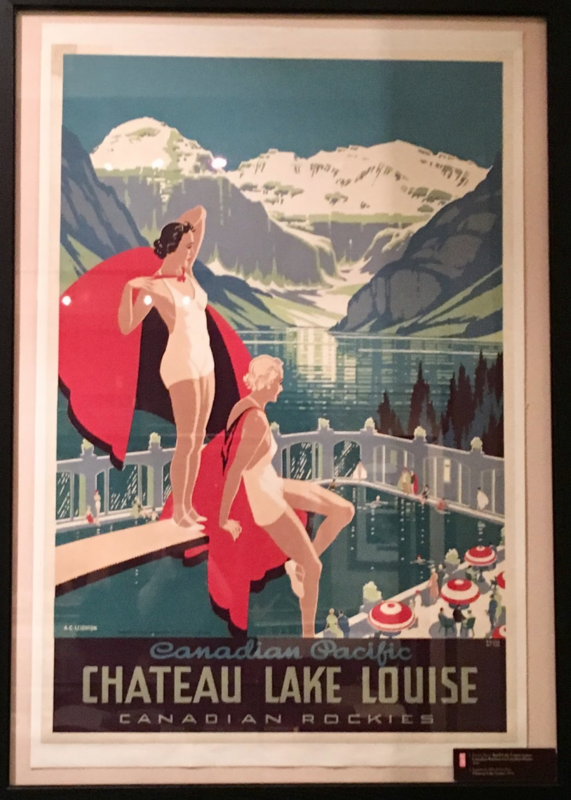 Ewert’s stylized paintings of iconic Canadian sites, like this one of Lake Louise, gave tourists an idyllic image of the Canadian adventure they could embark one with CP rail. This 1942 ad for the Chateau Lake Louise depicts bathers lounging lakeside, in the shadow of the blue-tinted mountains. Growing up in Alberta, Lake Louise is one of my favourite places to visit year-round — despite the usual focus on its winter attraction. To see a representation of bygone lakeside summers is a welcome break from the usual “winter wonderland” connotations that usually come to mind. 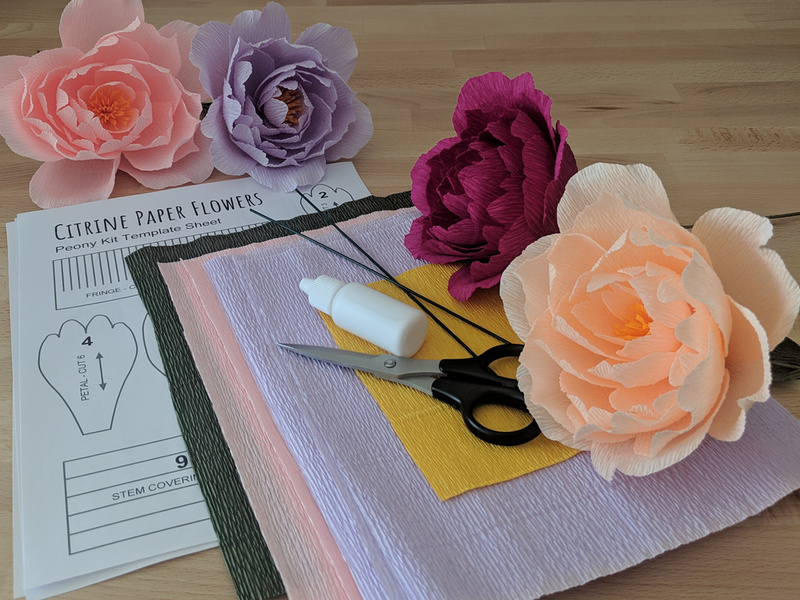 Though the tourism industry has evolved throughout history to match trends, some tourist favourites stand the test of time. The Canadian Rockies hold a reputation for world-class skiing — based on the Chung Collection, this isn’t a new phenomenon. 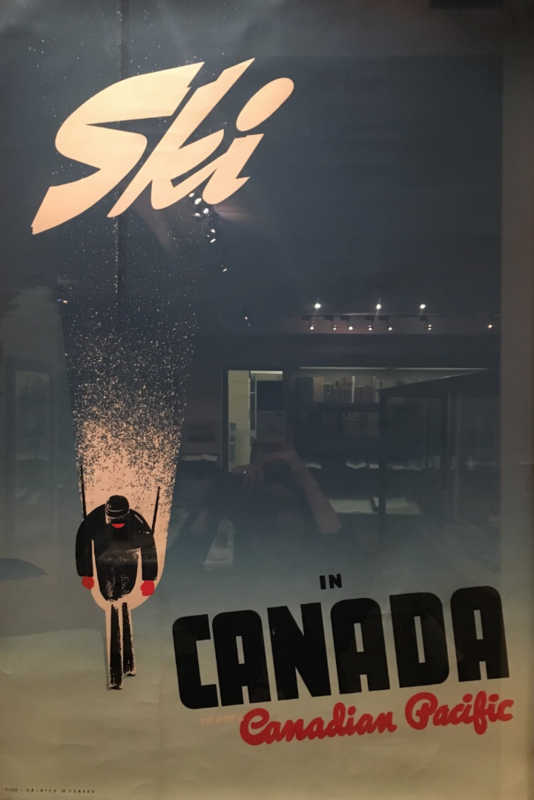 Ewert’s 1941 “Ski in Canada” ad, once again made for Canadian Pacific Rail, depicts a skier racing against a backdrop of blue sky. The nondescript design emphasizes the thrill of skiing in Canada at any of the many ski resorts that were already beginning to populate the Rockies. The image of the skier racing through a deep blue ski is the representation of my ideal day on the slopes: skiing so fast you’re barely touching the ground. How many modern travellers use physical guide books anymore? For early travellers exploring the Canadian Rockies, guide books were an essential resource. The Banff “Motor Detour” guide from Brewster Transport in the Chung Collection tempted tourists with a whimsical image of motorists encountering bighorn sheep. 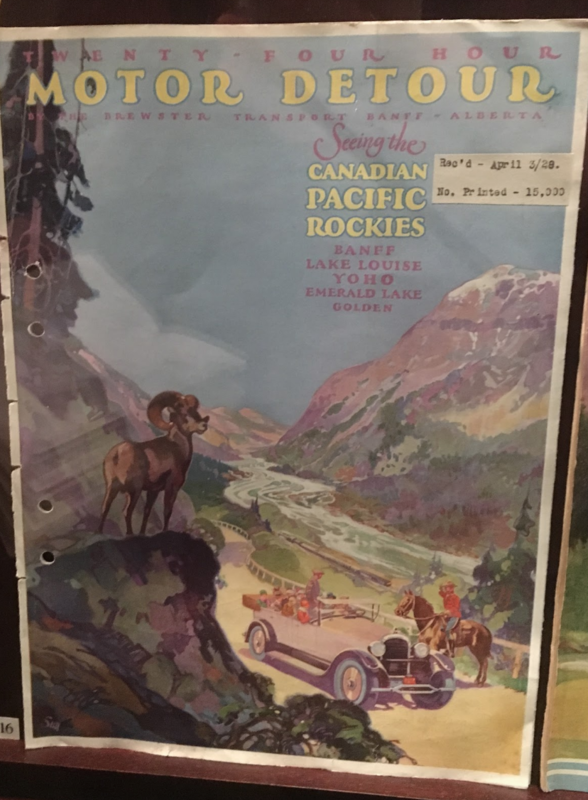 Issued in 1928, this guide book would have been aimed at tourists who wanted to experience the natural beauty of the Rockies from the comfort of their car. Call me a biased Albertan, but my first choice for any road trip opportunity would be Banff National Park — from 1928 until now, its indescribable natural beauty has been easily accessible by car, for any tourist willing to brave meeting a few bighorn sheep on the highway.